To end your 2018 on a slasher high, Hell Fest will be released on Digital on 28th December, so you can get your mitts on it before the year is out. To see if it tickles your fancy, check out the trailer below. A group of friends are bound for a horror-themed Halloween event at a local amusement park — a sprawling labyrinth of rides, games, and mazes that travels the country and happens to be in town. But for one visitor, the ghoulish carnival of nightmares is not the attraction — it is a hunting ground. On the night the friends attend, a masked serial killer turns the amusement park into his own playground, terrorising attendees while the rest of the patrons believe that it is all part of the show. As the body count and frenzied excitement of the crowd continues to rise, who will fight to survive the night? Hell Fest is a fun and familiar slasher, but it features some great kills and the killer does hold himself with menace. It’s certainly entertaining, if it’s not filled with too many surprises. 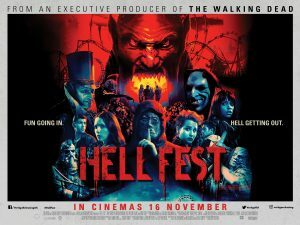 Hell Fest comes from director Gregory Plotkin (Paranormal Activity: The Ghost Dimension) and stars Amy Forsyth, Reign Edwards, Bex Taylor-Klaus and features a neat cameo from horror icon Tony Todd. After the digital release in December you will be able to purchase the film on Blu-ray, DVD and On Demand from 8th January, courtesy of Lionsgate.